CARLSBAD — One student used math, weather patterns and her gut to pin down the time and date for an emerging tortoise. Jolie LeMieux, 9, of Pacific Rim Elementary School submitted the winning entry into the Living Desert Zoo’s annual Mojave Maxine Emergence Contest. Using statistical analysis, weather patterns, past times and dates, LeMieux picked Feb. 8 as the date and the time of 12:31 p.m. for when Maxine, a desert tortoise at the Palm Desert facility, would come out of brumation (a lighter hibernation). As it happened, Maxine emerged on Feb. 8 at 11:56 a.m.
About 1,200 students in nine counties participated in the event and winners from each county were chosen. 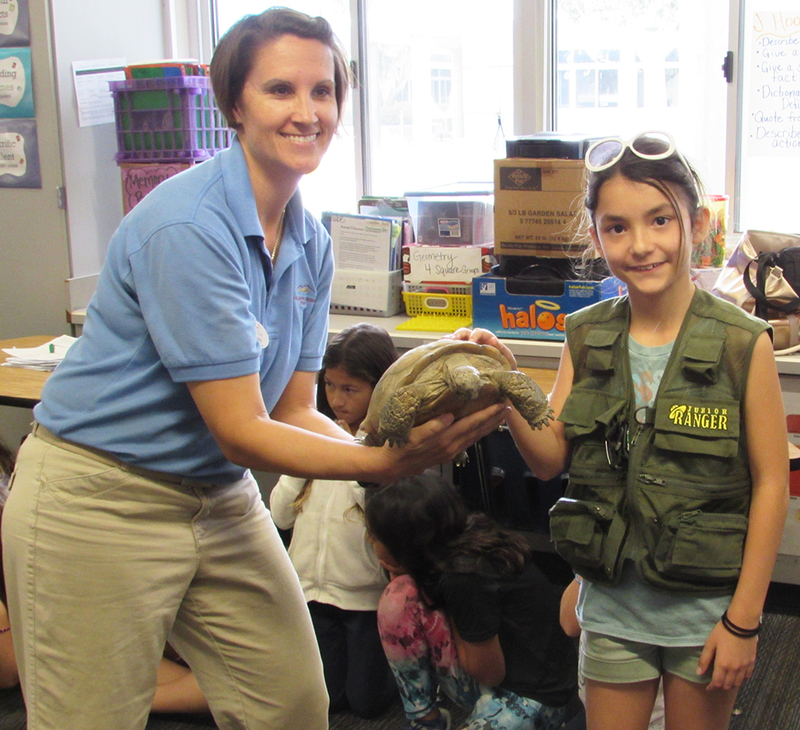 As a result, LeMieux and her third-grade class along with teacher Jessica Hamabe were treated to a visit from biologist Sarah Greely of the Living Desert Zoo and Meg, another desert tortoise, who travels to such events. Jamie Cousins, another third-grade teacher in the classroom, found the contest several years ago while on vacation and introduced it to the students. Greely gave about an hour-long presentation about the tortoises. She also brought three tortoise shells to show the inner workings of their bodies and defenses. LeMieux was also awarded a $50 Amazon gift certificate and a Federal Lands Pass for free access to any national park, forest or refuge. Hamabe received a $100 gift card for school supplies, while LeMieux and her class were given T-shirts, water bottles and posters. “She was hysterical when I called,” Hamabe said. Cousins and Hamabe said volunteer Terry Gibson was crucial in teaching the students about statistics, probability and other advanced math-based calculations to determine Maxine’s coming out party. Maxine, like Meg, are not the massive breeds typically associated with desert tortoises. Greely said Maxine and Meg will reach 15 to 20 pounds and live about 50 years in the wild, but lifespans reach 75 to 80 years in captivity. The program is similar to one in Clark County, Nev., where students there guess the emergence of Mojave Max. 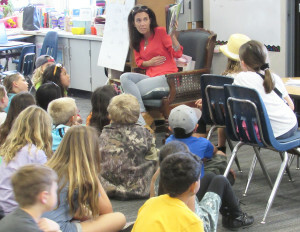 Like in Nevada, students in the nine California counties enter their submissions through the zoo’s website and wait until the tortoise reveals itself. As for Greely’s presentation, she discussed the tortoises’ environment plus predators. Due to more human interaction in the desert, which leads to more litter, ravens have become one of the most deadly predators to the tortoises. Greely said less than five out of every 100 newborn tortoises would reach adulthood.